Below you’ll find amounts for a double recipe, which makes one big loaf and is a good amount for my pan. My family can finish it off in one meal. A smaller family would get a couple meals at least out of it. Mix together flour, yeast and salt. Add warm water. Mix again til well combined. It will be a very wet sloppy-looking dough. Let rise in a covered bowl for 8-24 hours. 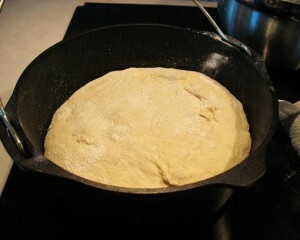 Dump dough out onto a floured counter and knead with wet hands just until top of dough is smooth. Don’t try to incorporate lots of flour– one of the reasons that this recipe works so well is because of the high water content in the dough. Re-wet your hands if dough starts to stick to you. Once the top of dough is smooth, flop the blob onto a floured tea towel. (If you only have terrycloth towels, use a pillowcase). Set the dough, tea towel and all, into a tall narrow bowl to rise for 1-2 hours. It will still be very loose and jiggly– DON’T worry!! It will work anyway! Near the end of the rise time, rub the inside of your pot with a little shortening and place it into the oven set on 500 degrees. Preheat pot and oven for at least 10 minutes– you want it to be good and hot. 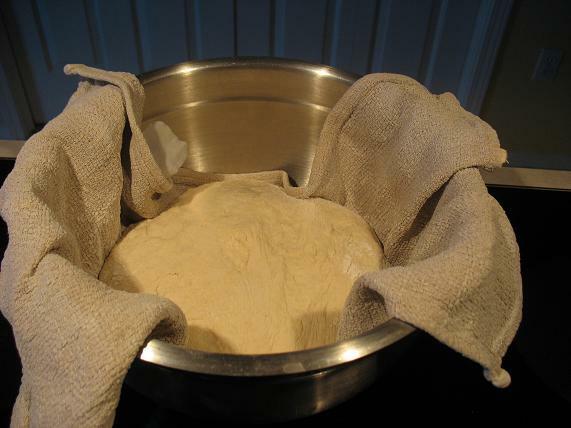 Once oven and pot are hot, lift dough out of the bowl –carry it using the tea towel like a little ‘hammock’. Flip it over into the pot, removing the tea towel. Don’t worry if it looks blobby and ugly. When it is baked, it will be a lovely rustic-looking loaf. Put the lid on the pot. Bake, covered, in a 500 degree oven for 40 minutes. After 40 minutes, remove the lid, and continue to bake for an additional 10 minutes. Remove when the top is a nice golden brown. Loaf should sound hollow when thumped. If you’re not sure if it is done, you can bake it for a few minutes more without hurting anything. This is a very forgiving recipe. Last time I made this, I forgot to remove the lid, and baked it 25 minutes too long, and it still turned out beautifully. Let me know if you try this recipe. I’d love to hear how it works for you. Thanks Mary, I will have to try this. I have a small Dutch oven that I hardly use! love your site!! i will try your braed for sure! Sounds wonderful! I’m linking. I’ll be sure to let you know how it turns out. Im gonna have to give this a try…it looks too good not to! Thanks for the recipe! “It will still be very loose and jiggly– DON’T worry!! It will work anyway!” ………….. it’s the story of my life, Mary! Looking forward to trying out the bread! Hi Mary, thanks for the recipe. Do you have any tips for slicing bread? It’s really hard to get it right. By the way, I won’t be going to San Francisco after all as my visa application didn’t go through. Tania– you are too funny! Hillary-I;’m sorry about the visa. As far as bread cutting, some people swear by an electric bread knife, but I’m usually too lazy to get mine out. In general, wait til the loaf it is somewhat cool, then saw back and forth a lot without exerting much downward pressure. 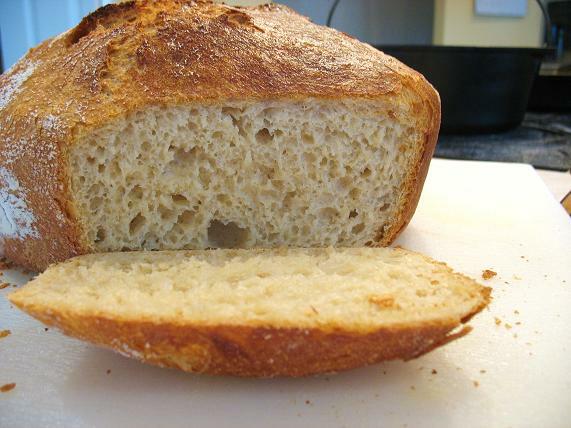 The crust of this bread is very sturdy, so you do have to press down some, but the good thing is that the interior of this bread is very elastic and springs back even after it get pressed together a bit. This loaf is actually large enough that I cut it completely in half to start with and then sliced each half into slices. It was easier to cut that way and made better sized slices. Mary: I was trying to email you but could not find a way to pm you so here it is on a the public bread area:) I am going to try this recipe too. I came across your sister’s info about going to Ethiopia on Equip’s website. We are going to be doing their community health training to prepare to go to Ethiopia too. I would love to get in touch with you and her about this. We will be in Addis though. This sounds similar to a recipe I make from the artisan bread in 5 minutes a day. You make a big batch of a simply wet dough like you describe then grab portions throughout the week to bake. As it is just me and my husband that works for us, although your family would probably eat the whole batch at once. I’d love to try this soon! I’m trying to get into breadmaking, but I know myself and I need to start simple or I’ll just give up. This looks pretty doable! I can’t wait to try this recipe. I will be putting bread flour on my shopping list next week! Well in that case, I might be making this tomorrow!! Love the bread. My family has given up store bought bread and will only eat this bread. I use a glass Pyrex casserole dish. I cut the recipe in half, it fits my dish better. Thank you for a bread recipe I can make. The bread comes out perfect, every time. Every other one I have tried ended up as “Brick Bread”. I made this several times when you first posted the recipe and it was wonderful. 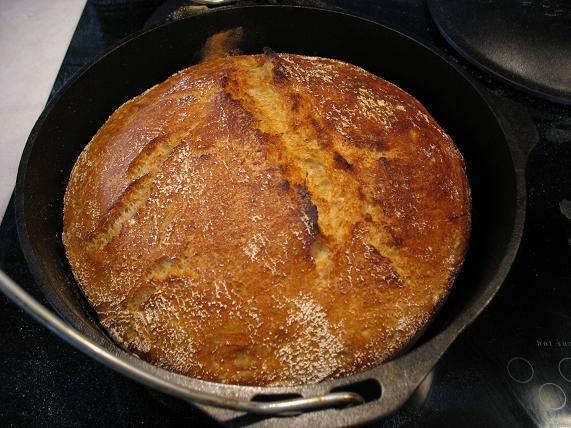 Just tonight, my kids were begging for “that good bread you made in that big pan”! Will have to make another batch (although I currently have your Cuban Bread in my oven. Your book was one of my “best book purchases ever.” I buy a lot of books I never look at, but your Family Feasts book is filthy–a sign that I use it (and spill on it) a lot! This was a great recipe to get the kids into breadmaking. And with such shining reviews, I’ll add your book to my wishlist now, if you dont mind!